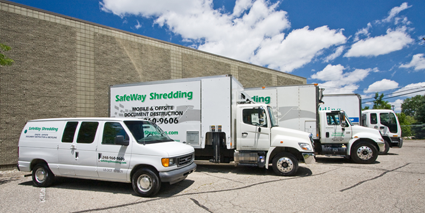 Let us show you the SAFEWAY to handle confidential and sensitive documents with our customized on site document destruction service. Your important documents will be properly cared for to insure no loss of privacy or confidentiality. You don't have to handle any messy shredding. We protect your company from snoops, competitors and undesirable outsiders. You can find us here too!! No shredder to purchase and maintain. No employee cost to pay and wasted productivity. No costly disposal of shredded waste. Most of all....there are no sleepless nights!